Seems like the universe is moving at warp speed at times, with a fascinating experience of not really being on the same train. It's like being aware of the surrounding chaos but not allowing my focus to be lost. That said, I still make boo boos. In the last newsletter, I posted Buffalo Medicine for December, 2012. It will actually be the beginning of 2013. A crystal workshop will be in December. See below. 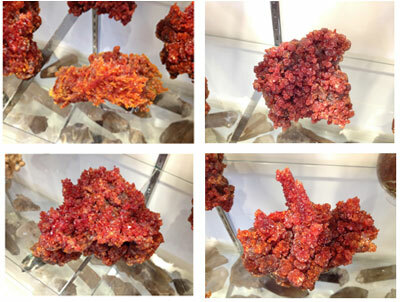 Another unusual happening is that a new batch of zincite was brought into the country at the Tucson, Arizona rock show. Last time I bought zincite of this quantity or quality was 20 years ago. Guess the world needs a first, and second chakra recharge. It crystallizes in the form of masses, grains, plate-lie layers, and hexagonal hemi- morphic crystals. The colors range from deep red, orange-yellow, yellow, green-yellow, and yellow-white. It provides for the synthesis of personal power, physical energy, and creativity, producing a stimulation of the electric currents within the body and facilitating the removal or gradual dissipation of energy blockages. It is useful in the radionics field to intensify the response patterns exhibited during use of the "check-surface". It can be used to help bring together those of like-mind; it is useful in promoting the group effort, interlocking and providing for the unification of the resultant effects. It is beneficial to furthering relationships on the physical plane. It can be used to improve the condition of the hair and skin. It can also be used for treatment in disorders of the prostate gland. It can provide for purification via catharsis. During a mine fire 100 years ago, semi-natural zincite was created. Although the fire was naturally occurring and was not due to the action of man, it has not been accepted as natural by the mineral community. However, it emits the same properties as natural zincite and further acts to increase focal emanation of the energy and to enhance it. It has been used to increase one's conscious connection with the higher realms, to align the subtle bodies with the physical form, to establish a highly charged electro-magnetic alignment to the physical body (wonderful for the healing situations) and to increase mental clarity and perception. My personal experience of zincite is that it has the capacity to vaporize cancer. Over the course of 20 years, I have witness complete elimination of cancer following a series of zincite lay-outs. It does not work all the time, but seems to respond to those that are making life/death decisions. When life is the soul choice, the zincite seems to work well. Note: a soul’s choice may not be the same as the existing body and person’s choice. Indigenous cultures refer to medicine as the essence of the person, place or thing. In our terms it is the essence of being a spiritual, physical, mental and emotional being. Cougar or Panther medicine is about the essence of the deep knowing spirit The cougar/panther is the second largest cat in the western hemisphere. It is also one of the fastest and most powerful animals, but it tires quickly. It is powerful enough to kill with its bite or its claws. It can leap over 40 feet. It is a stealthy hunter, and many of the qualities of the panther hold true for the cougar. If cougar has shown up in your life, it is time to learn about power. Test your own. Most young cougars learn how to use their power through trial and error. It strengthens them and hones their skills. When cougar shows up as totem, much of the trial has been worked through. Now it is time to assert. People may not like your asserting. They may try and keep you in the category they have always kept you. You can choose to remain so, or you can stretch your muscles and show your capabilities. Those with cougar medicine fall easily under attack, especially by those who have grown comfortable with the status quo and do not wish to truly see you grow. Remember that there will always be some who will not wish to see you come into your own power or will ever acknowledge that you have. 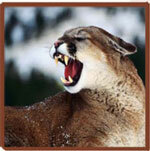 If cougar has shown up, there is a choice to be made, and it should be made quickly and strongly. A cougar leaps at its opportunities. The Cougar/Panther Medicine workshop is an initiation—a birthing process to more fully be who you are within the world. The focus is to discover the innate healing presence within yourself that have not been allowed to be seen or heard, let alone to mature as part of who you are. We will nurture those parts so as to begin to create a more centered and balanced life. Our intent is to create the sacred space that will enable you to fully birth who you are, shedding the parts that no longer serve the fullness of your presence. Each person will be given the opportunity to be initiated into the Cougar/Panther medicine. The fee for the workshop is $395 if paid by March 1, 2012. If paid after March 1, 2012, the fee is $445. This includes room and six hot meals as listed above. For further information, kindly call Lauren at 216-272-8438 or e-mail lauren@therockgirls.com to reserve a space in the circle. Please send a check, payable to The Rock Girls inc. Mail the check to The Rock Girls Inc 26635 Amhearst Circle #201 Beachwood Oh 44122. Once paid-in-full you will receive info on your stay at Camp Asbury. Due to the workshop focus and the unique facilities, the attendance will be limited to 25 people. Bear medicine is about transformation. Bear is the guardian of the underworld while being a true giver of life. The bear, as the walker between two worlds, remains fully embedded in society as it gives rich and diverse meaning to life through language. For example, we bear responsibility, bear the love of, bear watching, take bearing, bear on, bear tidings, bear shape, bear arms, bear in mind, and bear misfortune. Within our ancestral heritage, bear medicine has been used in ceremony to seek protection from bears, to seek protection by the bear spirit, the evocation of warlike themes, to invoke healing, to welcome seasonal or fertility rites, to invoke sacred initiation ceremonies, and to support the formalities of a judicial nature. The Crystal Integration workshop will focus on crystals and integration at the soul, individual and community levels. In some of the work, we will focus on the light body that is activated minerals (quartz) within the body. Some think that the activation of this light body is what regenerates our life force. Others believe that it is simply an illumination of the spirit. Regardless of your beliefs, we are going to explore this illumination through the creation of a massive sacred space. The fee for the workshop is $395 if paid by November 1, 2012. If paid after November 1, 2012, the fee is $445. This includes room and six hot meals as listed above. For further information, kindly call Lauren at 216-272-8438 or e-mail lauren@therockgirls.com to reserve a space in the circle. Please send a check, payable to The Rock Girls inc. Mail the check to The Rock Girls Inc., 26635 Amhearst Circle #201, Beachwood Oh 44122. Once paid-in-full you will receive info on your stay at Camp Asbury.